First let’s take a look at adding a watermark that covers up part of the image, the standard style watermark that you’ll see on photos. Assuming that you’re going to be automatically applying the watermark to photos, it is important to think about the tones being used in the watermark. 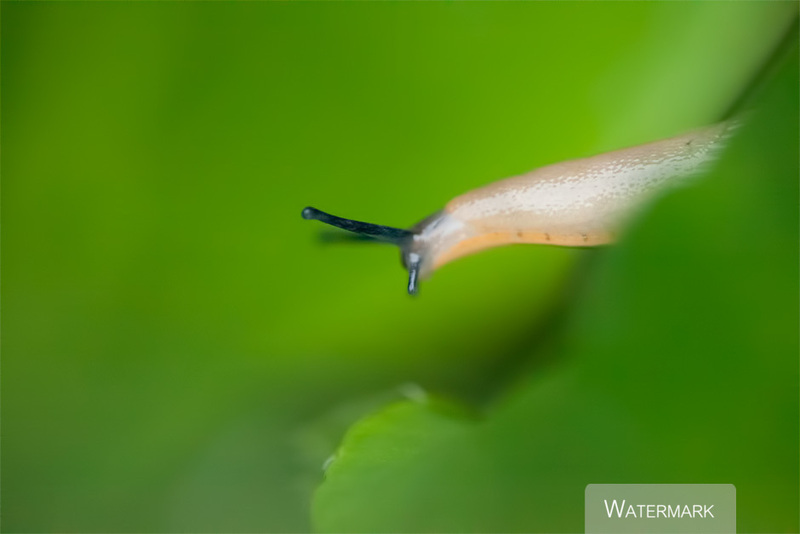 A white watermark will show up well in a dark photo, but will be hidden in a bright photo. Further, what if the watermark is positioned over an area of a photo that contains both light and dark areas – only parts of the watermark would be visible. For this reason, it makes sense to me to use a watermark with a background. Below you can see an example showing plain text watermarks in white and black versus a watermark incorporating a background. With the background the watermark is easily visible no matter what colour background the image has. The style of your watermark is obviously completely up to you. I have gone for a grey background at 50% opacity with white text at 100% opacity on top. You’ll probably want to create your watermark using a graphics editing program with a GUI. Though you could make something like this completely in ImageMagick if you desired. If the watermark is intended to be applied to only a couple of different image sizes, then I suggest saving out versions of the watermark suited to those sizes of images. ImageMagick can handle SVG files, which will scale to any size. But I would suggest using a raster format such as PNG instead. It ensures the watermark will be rendered correctly, and I suspect it should be faster. If using an SVG image as the watermark you need to add -background none to the command to stop a white background being applied to the SVG, and also add the height the SVG should be resized to in pixels e.g. Of course, generally you’ll want to apply the watermark at the same time as resizing, and performing other operations on an image. Thankfully the same arguments will also work as part of a convert command, e.g. Sets where in the image the watermark should be added. In these examples I’m using southeast, which puts the watermark in the bottom-right corner. You can use whatever direction you want, e.g. north for top centre. More info on the ImageMagick website: Command line options -gravity. Geometry can be used to modify the size of the watermark being passed in, and also the positioning of the watermark (relative to the gravity placement). It is specified in the form width x height +/- horizontal offset +/- vertical offset. If you have your watermark images already set to the correct size for usage, then you only need to specify the offset you want (if any). In my examples I’m specifying a positive horizontal offset, which pushes the watermark in from the right edge. More info on the ImageMagick website: Command line processing -geometry. Lastly comes the -composite parameter, which tells ImageMagick to add the watermark image we’ve just specified to the image. More info on the ImageMagick website: Command line options -composite. 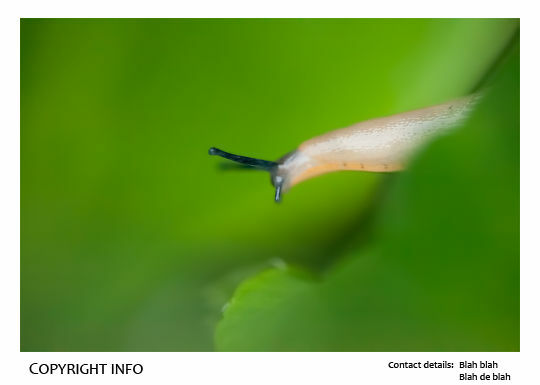 For a border type watermark, the copyright notice or contact details are printed in a border round the image, rather than overlaying the image itself. For this you will likely want a border that is larger in one direction (typically at the the bottom of the image), where the watermark can be added. ImageMagick doesn’t allow setting the border width as larger in only one direction (as far as I’m aware). But this can be worked around quite easily. Sets the colour of the border (who would’ve guessed?) You can read more about the different ways to specify color on the ImageMagick website: Command line options -fill. Sets the border width on the x axis and the border height on the y axis. So in this example I am using a 20 pixel border left and right, and an 18 pixel border top and bottom. More info on the ImageMagick website: Command line options -border. In this case we’re using gravity to control the placement of our border extension. Since I want the border to be larger at the bottom of the image, I’ve specified -gravity South. Background specifies the background colour to be used for our border extension. You’ll want this to the be same colour as your border, in my case, white. Is how the border is extended to the bottom of the image. Splice adds rows or columns to the image. Specifying a value of 0x15 means add no columns (which would affect the width) and add 15 pixels in height. Since we have set the gravity to South, the extra 15 pixels of height will be added to the bottom of the image. More info on the ImageMagick website: Command line options -splice. Then to automatically apply the watermark to images, it’s just a case of incorporating the relevant ImageMagick parameters as part of your image processing script. As I said earlier, you’ll probably want to be doing other things to your images at the same time, such as resizing, sharpening, and converting to sRGB for web usage. If I get time, I’ll cover these in a future article. 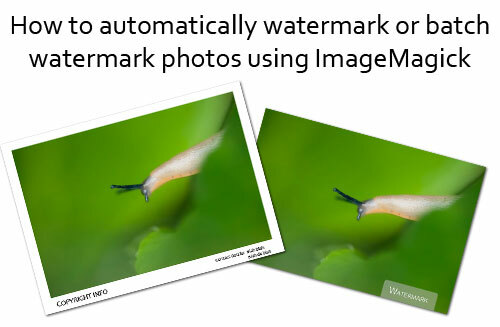 However, since I did title this article How to automatically watermark or batch watermark photos using ImageMagick , I guess I should show something about how to actually batch add a watermark. The above script will take all .jpg or .jpeg files in the current directory, resize to 500px on the longest edge, and add an overlay style watermark to the bottom right corner, indented 30px from the right edge. The watermarked images are then saved in a directory called ‘watermarked’. You would need to save the script as watermark.bat (windows) or watermark.sh and make it executable (linux and mac). Then place the file in the directory with the images you want to watermark before running it. The script assumes that the watermark file is named watermark-small.png and placed in the parent folder. Obviously I don’t recommend you use the above script as-is. But if you’re not familiar with shell scripting, it should at least give you a starting point you can work from, and modify to your own needs. This takes 1.gif and 2.png and creates 3.gif which is the watermarked result, any chance you would be able to assist to modify this string to get it to work with batch like you have done for jpg/jpeg? I’m away at the moment, and ImageMagick isn’t something I use all the time, so I’m afraid I can’t tell you off the top of my head. I can take a look at it after I get back, but it might be a few weeks as it will be 2 weeks before I get back and I I already have quite a few tasks piled up. I’ve had a look at this now and realise it was more of a batch scripting question than ImageMagick question you had. Yes, your command can certainly be used as part of a batch script. The exact script will depend on how you store your files and whether you’re on Windows or Linux / Mac. When I run this file (watermark.bat) it will first check whether the folder ‘watermarked’ exists, and create it if it doesn’t: IF NOT EXIST ./\watermarked mkdir watermarked. I hope that helps, if you’re still having trouble, let me know. Or if you’re on Linux / Mac let me know and I can give you the equivalent script needed. great script – would you mind publishing your Linux version as well? Remember that after you save it in a file, you need to change the permissions of the file to allow executing it. I hope that helps. Sorry, My english bad ^^! I’m not sure what you mean, the examples provided in the article should work fine with a batch of different size images. What’s the problem you’re having with it? I too want to add a watermark to tumblr gif’s #. I’ve followed your instructions and copied the code you created for Chris and made it executable. when i run the script it creates a new watermark directory but doesn’t add the watermark to the images/gifs. I have hundreds of images to watermark and I’d like to use your method but I’m getting stuck. I can’t figure out what is wrong. Can you?